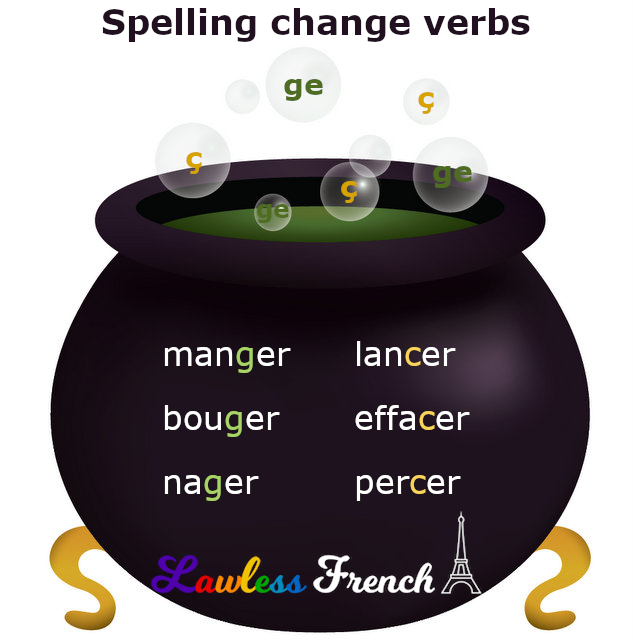 There’s no official name for them,* but I refer to French verbs that end in -cer or -ger as "spelling change verbs" because they require a small spelling change in certain conjugations. For the most part, these verbs are conjugated just like regular -er verbs, other than a little problem in some conjugations that must be corrected for reasons of pronunciation. It’s easy enough to do, once you understand why and how. (Note that spelling change verbs are completely separate from stem-changing verbs). There is no spelling change in the other conjugations of the above tenses and moods, because the c is followed by e or i, so it’s already soft. You can see all of these conjugations in action in the effacer verb table. There is no spelling change in the other conjugations of the above tenses and moods, since the g is followed by e or i, or in the past participle, conditional, future, or subjunctive. You can see all of these conjugations in the bouger verb table. * Le Bon Usage discusses these verbs in a section called Observations sur le radical, a) Verbes en -er : faits purement graphiques (as opposed to faits aussi phonétiques). ** These are spelling change as well as stem-changing verbs.